In Palermo I wished to eat and drink well. But the capital of Sicily is not awash with independent restaurants of the grand sort. So I did what every visiting gourmand has to do in this lovely city: I sought out the dining rooms of its better hotels. In particular, I made my way to the Centrale Palace Hotel, to sample the Ristorante Ai Tetti, and to the Astoria Palace Hotel, for a meal at the Ristorante Il Cedro. At both I drank wonderful wines at astonishingly attractive prices. The Centrale Palace Hotel inhabits an early 18 th century palazzo a few steps from what must be, architecturally, the most beautiful traffic intersection in the world. If only the motor cars had not been so fierce, I would happily have spent half an hour in the middle of the Quattro Canti, gazing up at its rich facades. Instead, I retreated from the hubbub and found myself in the quiet elegance of the hotel’s entrance hall. I was immediately soothed by the presence of good quality antiques – some featuring the sort of carved and gilded wood which particularly appeals to me. I paused for a moment to enjoy these surroundings and then took the lift to the fourth floor. Francesco d’Alessandro, the maitre d’ of Ai Tetti (properly dressed in black tie), took me across the floor of turquoise ceramic tiles to a table covered in yellow. I settled myself in the polished wooden chair and looked around. Outside was a substantial terrace (for summer use) and, beyond, views over the surrounding roofs. Inside, the room was of modest size, with windows on three sides. It felt cosy and comfortable. I examined the drinking glasses. They were of impressive size, shape and quality, but without a maker’s mark. 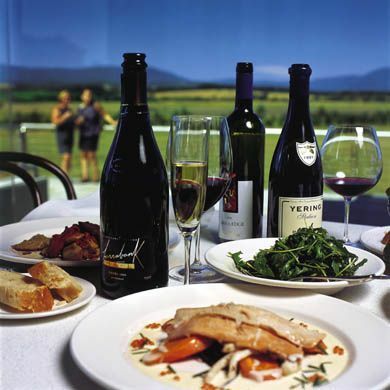 Apart from the champagnes, the wine list is Italian – with the home-produced offerings ranging in price from a local white at 14 euros to 2000 Tignanello at 75 euros. I am a fierce fan of Sicilian wines, so both my bottles were produced on the island. My white was the 2002 Planeta chardonnay – as always with this producer, robust and strongly structured. I loved the way in which its nose of buttered toast zoomed out of the glass. It was only 40 euros. And my red was even better. The 2000 cabernet from the Conte Tasca d’Almerita yielded crystallized cabbage and carrot to my nostrils, tinned strawberries to my mouth and a lingering, sweet aftertaste to my throat. Delicious. Yet this was all for just 45 euros. I left the Ristorante Ai Tetti a happy man. The following evening I headed for more modern surroundings at the Astoria Palace. 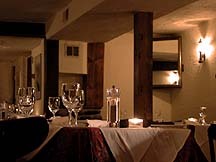 Its Ristorante Il Cedro is a large, brightly lit room, with a marble floor, lemon tablecloths and ochre-coloured, metal-framed chairs. Its chief asset is its maitre d’. I found Salvatore Crivello, resplendent in white dinner jacket, a most affable and helpful gentleman. He it was who, from the brief list, directed my attention to two more Sicilian wines. Plenty of sherbet, allied to a medium weight, characterized my pleasant white, the 2003 Maria Constanza, Inzolia e Catarratto Milazzo – which was priced at 20 euros. My red was one of Sicily’s most famous, the ‘1001 Nights’ (Mille e Una Notte), from Donnafugata. In its 1999 vintage, this was heavy with ripe blackberries, caramel and treacle. A massive wine – and only 60 euros. In Palermo I wished to eat and drink well. And I did. 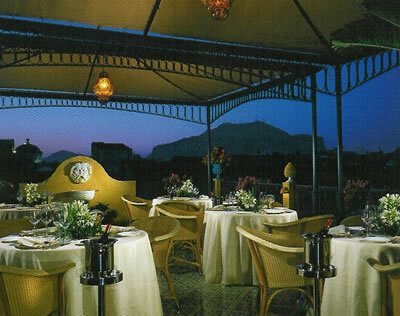 Centrale Palace Hotel, corso Emanuele 327, Palermo 90134, Sicily, Italy. 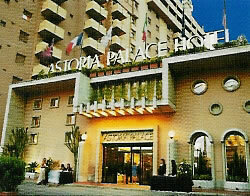 Astoria Palace Hotel, via Montepellegrino 62, Palermo 90142, Sicily, Italy.